This The Hunger Games PowerPoint game reviews Suzanne Collins' popular novel. It contains 6 different categories with 5 different questions per category. The questions below each category range from $100 to $500. 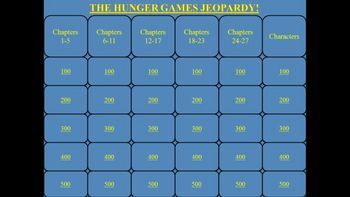 The categories are: Chapters 1-5, Chapters 6-11, Chapters 12-17, Chapters 18-23, Chapters 24-27, and Characters. Each question is stated in the form of an answer and each answer is stated in the form of a question, like the actual Jeopardy game. The PowerPoint also includes a countdown-timer on each "answer" slide, giving students a fixed time to answer each question. 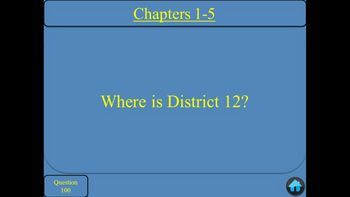 This PowerPoint game is a fun activity to use as a review of Suzanne Collins' The Hunger Games.